Erin grew up in Reading, Massachusetts, a small town north of Boston. After studying Environmental Science and Policy at Clark University, Erin began her career in remediation technologies cleaning up contaminated sites throughout eastern Massachusetts and then in the Philadelphia area. After becoming a mother, Erin’s want of sustainable living, naturally led her to environmental education. 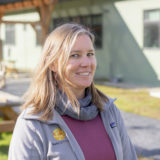 She volunteered, worked and taught in schools in Montreal, QC and then in Saint Albans, VT.
Erin brings her love of her community and the natural environment to her days at SunCommon. When not talking to people about renewable solar, you can find Erin enjoying her family in the beautiful mountains of Vermont!